Enjoy, Share and Preserve your precious home movies today and all the days to come by transferring your films to video. 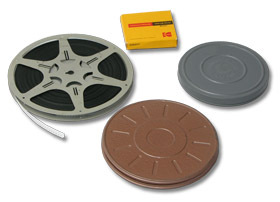 We specialize in film transfers of 8mm, super 8mm and 16mm movie film. We know how valuable your film is to you and pride ourselves on the quality of our service. Whether you are a professional or a consumer, you will find the film transfer service you are looking for with Prime Cut Video Productions. Besides film transfers, we offer: video transfers, photo/slide transfers, video editing and DVD authoring. 8mm/Super8 film to DVD "Eight millimeter" film is one of the oldest movie formats. It was first introduced in 1932. Most commonly, old 8mm is called Regular 8 in the US. Eight-millimeter film dominated the amateur market for thirty years, until Kodak decided to improve every aspect of the format, calling it "Super 8". Most common 8mm and Super 8 reels – 3" – can hold up to 50 feet of film, which is approximately 3-4 minutes of video. Let us take your old 8mm, Super 8, 16mm, slides and prints and convert them into a well organized, easily viewed professional quality DVD video or videotape. Let us save your precious memories today!